Microsoft has released Internet Explorer 9 RC (Release Candidate) for free downloads on February 10th. IE9 is the next generation version of web browser in the IE web browser, which Microsoft hopes to regain the favor of end-users and increase IE market share in the competitive web browser market. 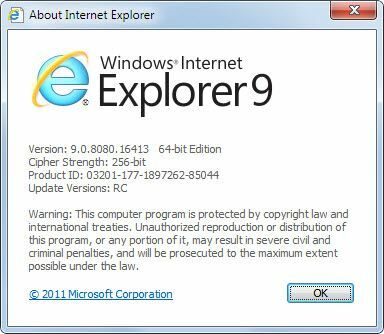 Internet Explorer 9 sets to be the most standards-compliant web browser especially on HTML4 scripting language support. It features streamlined design, enhanced tabs, new Tab page, ability to search directly in address bar, and add-on performance advisor. Also includes are GPU-accelerated graphics rendering via Microsoft DirectX technology, download manager, notification bar and better privacy and safety functions. It supports both Windows Vista and Windows 7, but the product is obviously geared towards Windows 7. Windows 7 users can pin individual websites or web apps to Start Menu and Windows Taskbar through a feature called Pinned Sites, which can have custom jumplists with minor code addition. And to make IE9 runs faster, installation of plug-ins and add-ons have been strongly discouraged. core themes of speed, streamlined design, privacy and security, and interoperability. IE9 RC has the build version of 9.0.8080.16413. IE9 RC in all languages can also be downloaded from microsoft.com, in addition to the direct download links to setup installers above. You can download Internet Explorer 9 Release Candidate in the language that matches your version of Windows or choose the English version, which works with all versions of Windows Vista and Windows 7. IE9 RC can be installed and upgraded directly from IE8 or IE9 Beta, without having to uninstall the previous version of IE. However, computer has to be restarted after installation. The IE9 RC is feature complete according to Microsoft, which means no new features will be added to the IE9 and the final RTM version of IE9 will contain only bug fixes when comparing with the RC. However, it’s not the case when comparing IE9 RC and IE9 Beta, where Microsoft has made several changes and improvement to user experience and user interfaces such as ability to close a tab without making it active, Pinned Sites, and has added features such as ActiveX Filtering and Tracking Protection, which allows users to limit the browser’s communication with certain websites to help keep information private.